Committed to Active Healthy Living for a Life Time! Creating "A BETTER YOU!" Be your BEST! I am the canfitpro PRO TRAINER for the Fitness Instructor Specialist Certification Course / Exam. I help you build a strong TEAM of Professional staff who are knowledgeable, motivators, communicators & educators. Your programs become creative, safe, well rounded classes for all participants who keep coming back. Thunder Bay hosts for canfitpro Fitness Instructor Specialist Certification Course/Exam - at Confederation College Wellness Centre. Please Register 3 - 4 weeks prior to course & exam for best price. This is a comprehensive 25-hour course that will increase your knowledge in anatomy, physiology, bio-energies & more. Prepare you for a theory exam & practical. With Certification you will have confidence to lead a variety of group fitness class with music were we are different then the personal trainer. 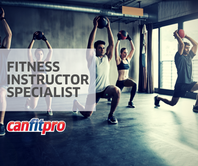 Your completion recognizes you as a professional expert in the Fitness Industry. Love fitness become a Member click on logo get Healthy Recipes, Fit TIPS, Articles from the best. Thunder Bay 55 + 700 River St.
Find the Best Equipment for land and water exercises & professionals ready to start their Fitness Business. Children’s Fitness Tax Credit and an Adult Fitness Tax Credit. Please take a couple minutes to select your responses.